In June 2014, our client wanted to use AGI resistivity imaging tools to locate a groundwater well in West Texas as well as geohazards that could cause significant damage to their property. Our client used the SuperSting™ R8 Wi-Fi, SwitchBox 112, Passive Cables spaced at six meters apart, and a Dipole-Dipole and Strong Gradient array. To model the data, they used EarthImager™ 2D with a finite element inversion model. 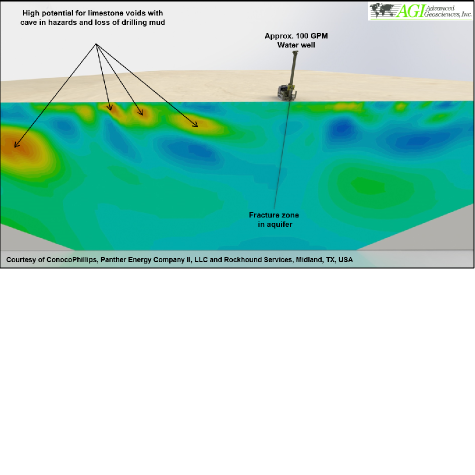 Our clients successfully located a large underground pool (aquifer) of brine water that could support a relatively high-production water well—approximately 125 gallons per minute in a region where 10 gallons per minute would be common when not using resistivity imaging. They also identified several areas that were likely to cause cave-in hazards for drilling equipment. Versatility. This method is ideal for searching for any type of water—fresh or brackish/brine. In the fracking industry, huge amounts of water are needed for operations, but the water does not have to be of drinking quality—brackish water (water with salt concentration between freshwater and seawater) or even brine water (water with higher salt concentration than seawater) can be used. Brackish and brine water is actually easier to locate using resistivity imaging, because the salt concentration makes it more electrically conductive than fresh water. For people looking for fresh water, resistivity imaging is an excellent option— the method can be used to exclude locations with salty water when drilling for fresh water. Reduces costs. Identifying larger aquifers with high flow rate reduces the cost of shipping water for drilling. Resistivity imaging helped the client find nearby brackish water that can’t be used for human consumption or for agricultural purposes, which makes it ideal for the drilling operation. Instead of using local groundwater supply or shipping in millions of gallons of water to the site for drilling, we helped the client find a great solution that benefited everyone involved. Saves money. It is very expensive to drill, and if you’re wildcatting wells, you’re leaving your success to chance—while you may hit water, the chances that you’ll hit an area with high flow rate are incredibly lessened when you drill without resistivity imaging. Protects assets. In this case, the client was able to see the locations of potential geohazards, including areas that could damage the equipment on the surface or voids that might cave in and damage expensive equipment or lose drilling mud/fracking fluid. Data courtesy of: Taylor Morris, Rockhound Geological Services, LLC.